This is a sponsored conversation through Savings.com but all opinions are 100% my own and may differ from yours. I will only endorse companies, products and services that I believe, based on my own experiences, are worthy of endorsement. I’ve had a membership at Sam’s Club for years. It is my go to store to stock up on cleaning supplies, office/school supplies, and coffee, to name a few. One of the biggest ways to save money is to buy cleaning supplies in bulk. Cleaning supplies can get expensive, but buying them from Sam’s helps me not only save money but by purchasing in bulk, they last longer. Which means I don’t have to shop for supplies as often. 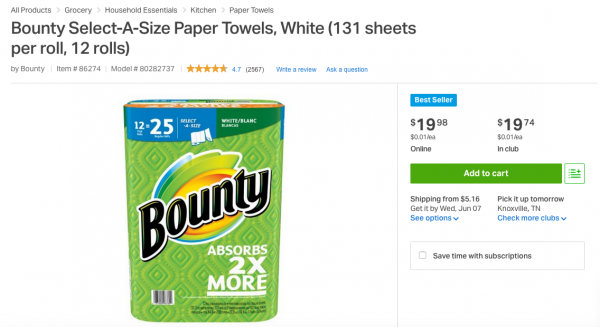 I always buy my Bounty paper towels, dishwashing pods, and Clorox wipes from Sam’s Club. We go through a lot of printer paper and ink, especially during the school year. My son loves writing, one of the things he wants to be one day is a writer. So he is always writing stories on his iPad and then prints them out to put in a binder. As a Board secretary to a non-profit, I send out a lot of thank you cards, so between my son and myself, we run through a lot of printer ink, too. Thankfully, I can save on printer paper and ink at Sam’s. I have a love affair with coffee. 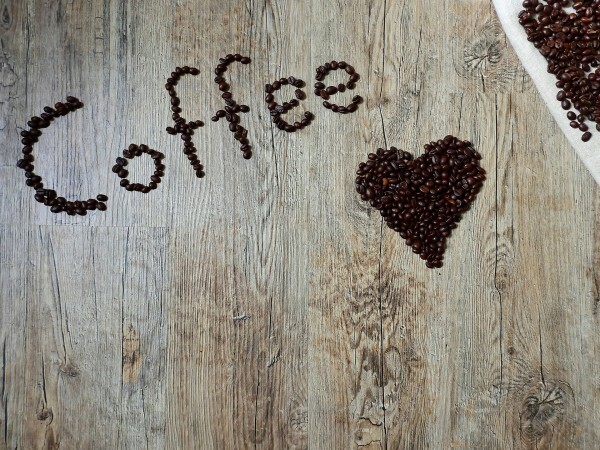 Not counting the people in my life, I couldn’t imagine life without coffee. I drink a LOT of coffee. 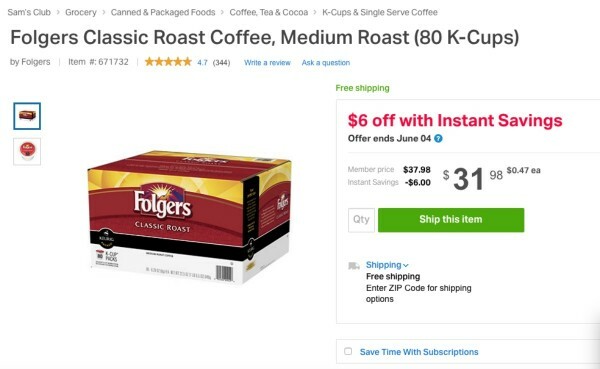 My favorite place to stock up on coffee is at Sam’s Club. I get huge savings yearly by buying my coffee from Sam’s. Coffee is definitely my biggest MUST HAVE item. I can’t find a better price elsewhere on the above three categories, that’s why Sam’s Club is my go to store for my MUST HAVE items. We save a lot of money on our grocery shopping each month on all our must have items, too. Especially during holidays and in the warmer weather when we do lots of grilling and cooking out. The Sam’s Club Savings of $45 membership is the lowest among warehouse store membership fees you’ll find. With this coupon, you can get a $20 gift card when you sign up for membership, making it an even better value. Sam’s Club is rolling out programs and tools to increase the convenience of shopping at their stores like self-checkout, online ordering/shipping to store for pickup and the Sam’s Club app. They offer easy online re-ordering, so you can have products you use regularly shipped, quickly and easily, to your house. I’m so loving this benefit! width=”0″> Starting today through Friday, June 2nd, 2017 at 11:59 pm ET you can win a Sam’s Club membership! 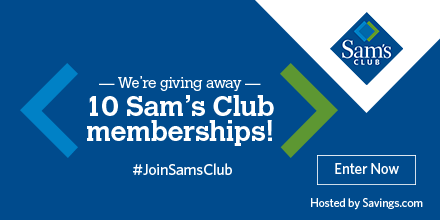 Ten (10) winners will receive a gift card for a one-year Sam’s Plus membership to Sam’s Club worth $100. Users enter the giveaway by heading to the Sam’s Club merchant page on Savings.com and submitting their email address on the form on the page. The winners will be chosen at random and notified on Monday (6/5) via the email address you use to enter. What an awesome giveaway! I have my fingers crossed that one of YOU (or ten), my Blog By Donna readers wins!